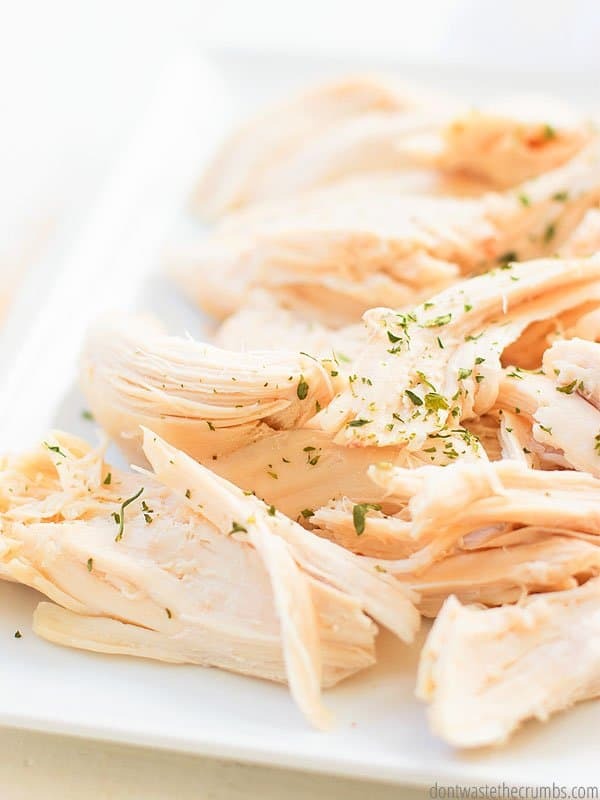 Having shredded chicken in the freezer is a lifeline to a busy mom. Being able to pull a package out at the last minute and pick any one of these 38 meal ideas that use rotisserie chicken makes dinner quick and easy. If I want shredded chicken, I usually make all purpose slow cooker chicken. The only problem with that though, is that the texture is sometimes too soft. And my husband isn’t a fan of mushy chicken. 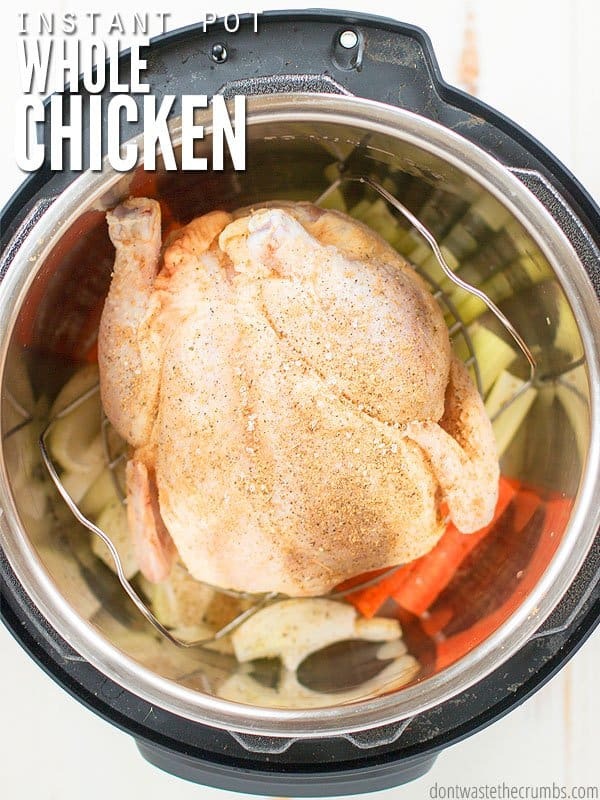 There’s an easy fix for that though – Instant Pot whole chicken! Using the Instant Pot to cook a whole chicken is the best of both worlds. I can cook up a chicken in under an hour, shred it up, portion into 2 cups and put it into the freezer. My husband can enjoy chicken that isn’t mushy and in fact, tastes a lot like a traditional oven-roasted chicken! There are lots of different ways you can make an Instant Pot whole chicken, so let’s talk about a few basic variations. Anything you put in the Instant Pot with your chicken will add to the flavor of the chicken itself. That’s why you see vegetables in my pictures, but other ideas include adding citrus and fresh herbs. You can also freeze fresh herbs if you have extra! One main difference in cooking a whole chicken in the Instant Pot is that you won’t get a crispy skin. There are two ways around this – sear the chicken beforehand, or brown the chicken after the fact. Ultimately, the only thing you REALLY need to pull off a delicious Instant Pot whole chicken is 1 cup of water and 1 whole chicken. How is this so? Because of the way the Instant Pot seals in the juices and cooks the meat under high pressure, it’s naturally tender and so juicy!! If you don’t have vegetables, add some salt, pepper and whatever other dry seasonings you have and call it done. I sprinkled dried Italian seasoning and ground coriander on top with coarse salt and pepper. I only used vegetables because they make the pictures a bit prettier (just being real!) and because I wanted to make chicken stock with the bones of this chicken. Speaking of chicken stock, did you know you can make it in the Instant Pot too? I have a tutorial and recipe coming for that soon, so stay tuned! 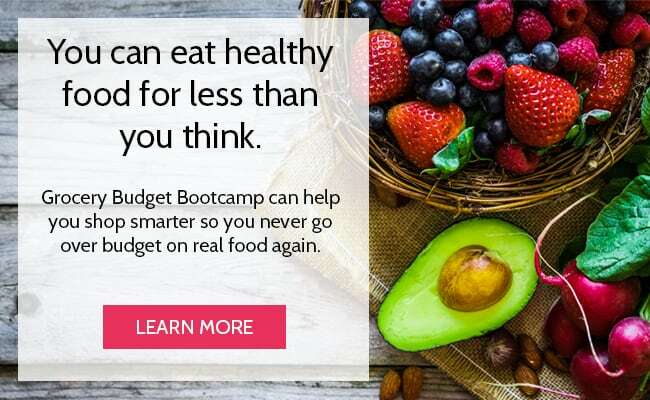 Meanwhile though, whatever you add to your pot to flavor the chicken – whether it be vegetables or herbs or citrus – save it in a container and stick it in the freezer. You can use it to boost the flavor of your homemade chicken stock! 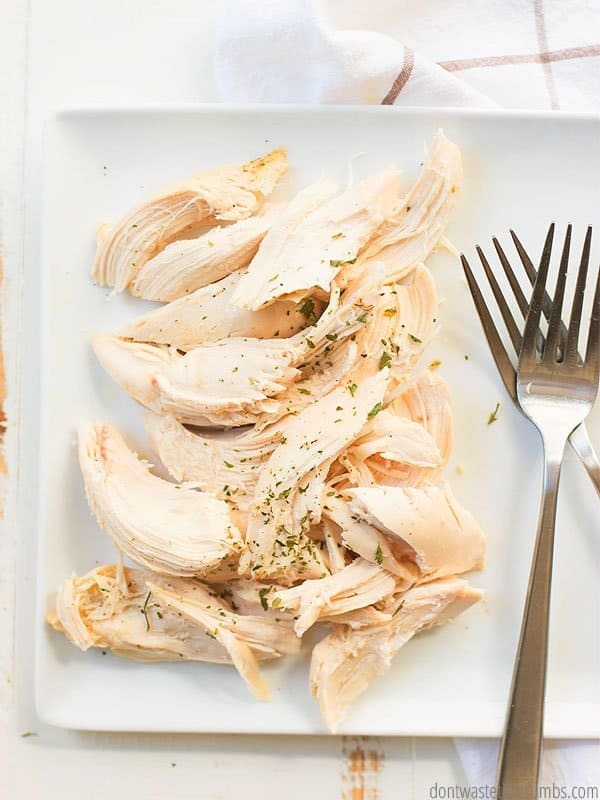 Can you make Instant Pot FROZEN whole chicken? Surely I’m not the only one who has ever forgotten to pull meat out of the freezer to thaw, right? 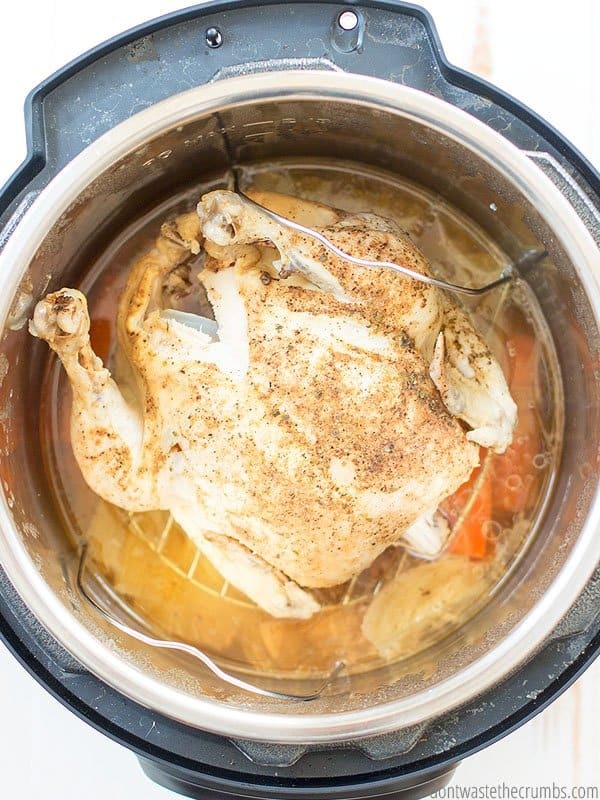 I’ve cooked both a whole chicken THAWED and a whole chicken FROZEN in the Instant Pot using this method and both come out smelling absolutely delicious! Note that though it can be done, frozen chicken requires more time to be cooked correctly. I’m still working on testing the best way to cook it frozen in the Instant Pot. I personally prefer cooking thawed chicken over frozen simply because the meat is a teeny tiny bit more tender, but I only notice this when I’m actually taste testing portions of the meat side by side. If you’re making chicken enchiladas or buffalo chicken pizza or cashew chicken or kung pao chicken – you won’t even notice. One other note if you’re using a frozen chicken – the giblets. You know how some chickens come with a sack of the giblets inside? Well, if your bird is frozen, you can’t get that out… and if you put the whole thing in the Instant Pot, you’ll cook that too. It’s not the end of the world (trust me), but just be aware that it’s there when you go to carve the bird. And oh yeah – set it aside for stock! 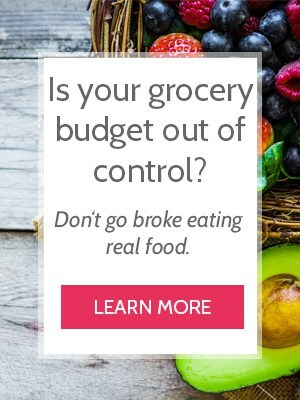 I have lots of tips on saving money on real food – after all, this whole blog is dedicated to that exact topic! If you need leftover chicken, portion that out FIRST and set it aside. Expect whatever you put on the table to get eaten, so portion leftovers or lunches before serving dinner, accordingly. Aim to get 3 meals out of one bird. One 5-6 lb chicken yields about 6 cups of shredded chicken. For most meals, 2 cups of chicken is enough. Always save the bones! Money spent on chicken stock is money wasted. Homemade chicken stock is DELICOUS and so easy to make. All you need are chicken bones! I have this Instant Pot. 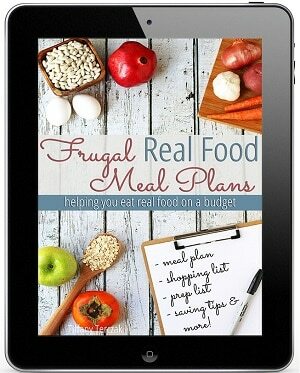 I love using it for kitchen staples like brown rice or “fancy” meals like beef and broccoli! Read how the Instant Pot saves money and these 20+ things to know before you buy. While I usually buy my whole organic chicken from Costco, the organic chicken from Butcher Box is really good! 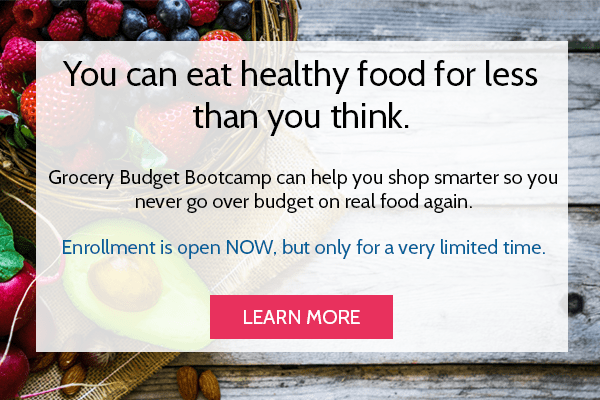 It’s a great option if you don’t have an organic option locally. 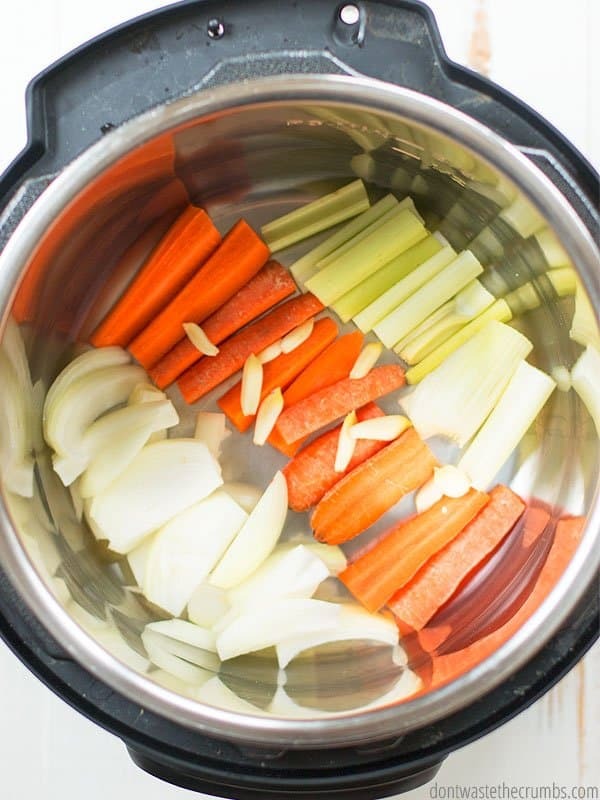 Place the vegetables in the bottom of the Instant Pot. Place the wire rack that came with the IP on top. Place the chicken on the wire rack. Add water to the bottom of the Instant Pot. Sprinkle the chicken liberally with seasonings. Turn the pressure valve to "sealed." Press "manual" or "pressure cook," make sure the setting is on "high" and cook for 6 minutes per pound of bird. My bird was just over 5 pounds, so I set the timer for 30 minutes. Make sure the "keep warm" function is NOT set and use the natural pressure release method. When the pressure valve is down, the chicken is done. Shred the chicken with two forks and serve as desired! Do you add flavor to your chicken when you cook it whole? Or do you keep it simple? And have you ever tried cooking a FROZEN chicken in the Instant Pot? Leave your thoughts and comments below! My only caution on IP’ing a frozen cooked chicken is sometimes the giblets can be in a bag that contains plastic. I cannot imagine that eating meat cooked with plastic is good for us. We use the Costco organic whole chickens, which unfortunately do not have giblets inside (at all), and so this is a moot point. Thanks Kathleen! It must be a regional thing… or maybe the quality of chicken? I’ve seen the giblets in paper bags, but it’s been awhile since I’ve seen plastic. Hi there! Reading through all the details before turning on our IP to make this. I’m using Costco organic whole chicken and double-checked … there are loose giblets and neck inside but not in a bag. Probably easily missed. Besides the veggies in the bottom of the pot, I added chicken Better Than Bouillon, and seasoned with Italian blend and sage herbs, fresh ground black pepper and pink sea salt.. Thank you so much for posting these IP recipes – I’m working my way through your challenge! You’re very welcome!! Just a heads up on the Better than Bouillon – it has a lot of salt. It might not make a difference in a dish like this, but if the chicken comes out salty, that could be why. Great recipe! What size Instant Pot do you have? I received the 6qt size for Christmas and I’m excited to start using it. Thanks Kalico! I have the 8 quart DUO. I’ve learned on the 6 quart, a 4 pound chicken is about as big as you can go. But I’m in love with the IP. 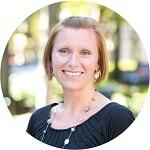 Tiffany – Thank you for all of your information and posts!!! 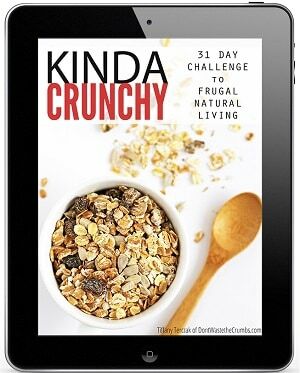 I’m so excited by your Daily Instant Pot Basics Challenge and have leaned a lot already!!! I have the 6 qt Instant Pot and tried to cook a frozen 4 1/2 lb chicken (organic from Costco) and unfortunately, after a 1 hour and 30 minute cook time (plus time to build pressure beforehand and release pressure afterwards), PLUS 10 minutes under the broiler to brown and crisp the bird, it was still raw in the middle. We sliced off the breasts and finished cooking them in a saute pan. What would be your recommended time per minute with frozen meat? **Oh and our bird did have a paper bag with the giblets frozen inside – I will definitely remove those before freezing my chickens in the future. I’m wondering if the difference is my Instant Pot is a 6 Qt and yours is an 8 Qt???? Could there be better circulation with the larger pot that it cooks faster? Maybe? I’m not sure…. I’ve done a frozen chicken once, and it wasn’t completely done either. Definitely more experimenting needed! My guess is that it never came to pressure. Sometimes you have to press down on the lid to get the valve to fully lock and allow it to fully pressurize. I love this series because I have an Instant Pot and am always looking for new ways to use it. However, I have to respectfully disagree—I think Instant Pot chickens are flabby and unappetizing. I’ve gone back to the baked in oven version, followed up by stock made in the Instant Pot. I have an 8 qt IP too and a lot of recipes say 1 cup of liquid but my manual says at least 18 oz?? I’ve been scared to use less than that. Is yours different? I’m not sure if mine is Duo but I thought so. Thanks. I made a whole chicken in my IP and it was fabulous! I used a layer of potatoes to keep the chicken elevated, and chicken broth instead of water to flavor the potatoes, and it was delicious! I have one question though… do you have an easier way to get the chicken out? It was so big and floppy that tongs didn’t work, and it was way too hot to handle for quite a while. Thanks so much for all the IP advice – loving this series! I’m so glad you like it Adrianne! I like using the trivet to get the chicken out. Do the potatoes again, but put the trivet in and the chicken on top. Then you can pull the trivet out with the chicken on top using pot holders! I used your instructions for cooking my first whole chicken in an electric pressure cooker. I did not buy an Instant Pot, instead I purchased the Mueller Pressure Cooker. I cooked a 6.56 lb chicken, defrosted, sans giblets, in a 6 qt cooker. I put 1 cup of water in the bottom, my chicken sat on the wire rack inside the pot and I set my menu to broth and manually set the time to 40 minutes. Within an hour I had perfectly cooked chicken ready for soup. My cooker came to pressure in about 5 minutes. This is my first time using any kind of pressure cooker and I was a bit nervous but it went smooth and easy and I am making my second round of stock using the bones from the perfectly cooked chicken. I also used your instruction for the stock. You’re so very welcome!! I’m glad it turned out on your first try – enjoy the beauty of pressure cooking! You mentioned that fresh herbs are very expensive and I agree. I don’t know where you live (we have pretty cold, but snowless winters and very hot summers,, but I grow herbs in raised beds and when the winter is going to kill them I cut, dry on a paper towel on my counter, and have my own dried herbs for the winter. I chopped the celery, carrots, and onions smaller for soup. Chopped fresh ginger and garlic and cooked as you stated. I pull the carcass out theb throw some extra shredded chicken, season to taste, maybe add a boullion cube or two and then I have chicken soup in addition to shredded chicken! So glad you liked this Kayla, and you got two dinners in one go! My frozen chicken was not cooked, I am fairly certain although I did not shred it yet. Pulled the chicken out on the rack onto a plate. I let it sit a few minutes while I strained the broth. When I came back to put it into the bowl to refrigerate, there was blood on the plate as well as when I took the gizzard, neck, etc. out of the chicken they were also red. There may have been something I did wrong, but I was so disappointed that I am going to have to cook it again.